On Wednesday, I will be leading a discussion in my undergraduate History Practicum seminar about learning to distinguish between reliable and unreliable sources on the wide-open Internet. 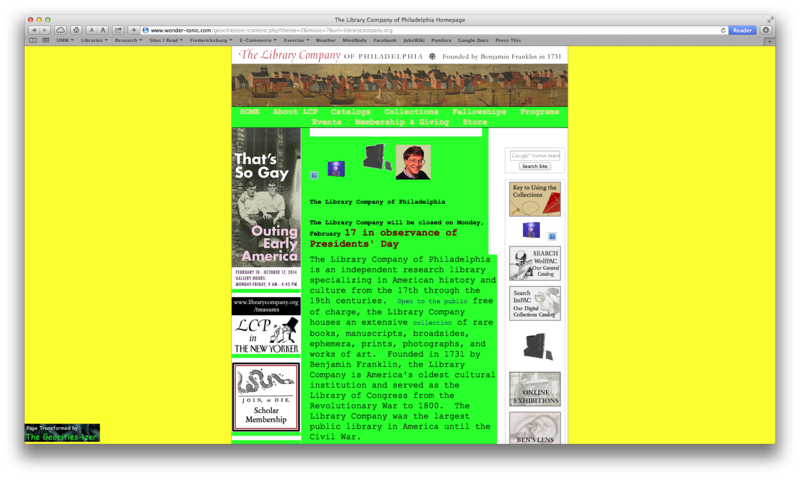 The students have been assigned to bring in an example of a good and a bad historical website on their topic, but I would like to have my own examples of some spectacularly bad history websites to pick apart in class. I want websites that are factually wrong, absurdly presentist, politically problematic, and straight-up plagiarized. So what’s your favorite example of bad historical website? Email it to me or post it in the comments below. Oh, and I guess I’m also interested in your favorite example of good history websites, too. Thanks, collective cloud-brain! I’m not sure about bad history sites (other than questionable design choices) but here are two great ones that we’ve talked about in Digital History! Thanks for your kind comments about the VPCP! All best wishes for your work. So, there’s a middle ground here I think it’s helpful for students evaluating sites to get. http://law2.umkc.edu/faculty/projects/ftrials/manson/manson.html is a particularly dated looking site, with some questionable design choices (especially on this particular page). But a number of legal historians I know see the site (with many additional legal trials and many primary sources from them) as an incredible, useful, trustworthy resource. Our web-based aesthetic/design sensibilities, however, make us think it’s not a good quality site. So it’s a good example to students of the need to push past the aesthetic or design when evaluating sites. Thanks Jeff and Leah, these are helpful … but I still want some really bad ones! I think it will be productive to shoot a couple of fish in a couple of barrels. I taught high school English for a number of years and I always used the link below as an example of how messed up the internet can be and how important it is to understand who is saying what. The site is often used as an example of the challenges of discerning quality and unbiased material on the web. According to a newspaper article (http://seattletimes.com/html/entertainment/2014686124_apuswhitehousebiographies.html), the White House presidential biographies (http://www.whitehouse.gov/about/presidents) are suspect. I didn’t double check it though. Thanks again. These are all great and useful! There are dead links, there is no organization, It’s unclear what the purpose of the site is. There is little explanation for why somethings are listed and some are not. There are scribal and transcription errors. Some things were copied from documents that are now available from the archives who possess the originals. If you use the access database search facilities for newspapers it is unclear how thoroughly the newspapers were indexed (not thoroughly at all, solely for local news, mainly genealogical). I am of the opinion that no one should bet their academic credentials on the unattributed listings of others. Historical plaques and signs are commemorative objects of the time of their creation, but cannot be accepted as credible sources for the dates and narratives they present. If a student is going to give evidence, they should observe the document, or the artifact themselves and make their own judgment. It is professionally more uncomfortable to be sloppy and lazy than to be wrong (with evidence). For example, I would not accept any student work that cited the opinions of Works Progress, or Federal Writer’s Reports (as available from the LVA), except when the reports are reporting the actions of their authors. 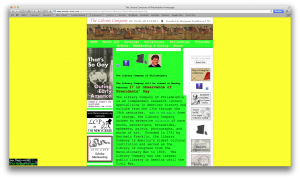 Similarly I find the American Memory site of the Library of Congress great, but the explanations of the individual collections are often digital versions of out-of-date research, unattributed and in error. The microfilming of documents of the 1940s-1980s created sources for quick cheap ways to digitize material–only often the material was poorly or more charitable just convenient. Hi Gary, that website is a bit of a hodgepodge, but it’s nowhere near the kind of “bad” that we talked about in class yesterday. I was more thinking of sites that have a specific contemporary political agenda, and that purposely misuse and misconstrue the past in order to push that agenda. The site you sent me just a bit old, which is several orders of magnitude less bad.